For a really long time I wanted to paint my own Mugs. 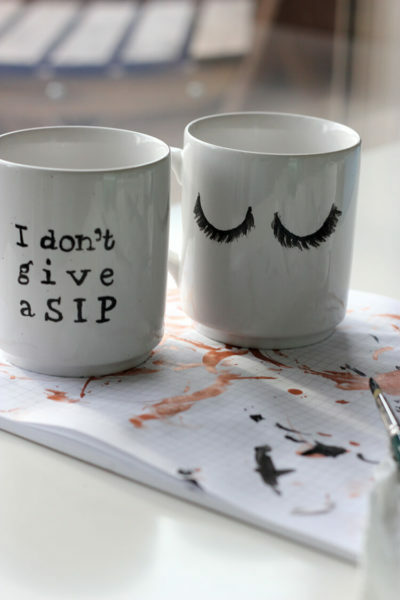 You know like the cool painted Mugs you see all over Pinterest, Etsy and Co. with fun quotes and quirky illustrations? Yep like those. I already marbled some planters so how hard could it be, right? Eventually I started hunting for my supplies. I bought some super cheap white Mugs at a flea market for 0,50 € each and porcelain paint that you won’t have to bake in the oven. You could also use a sharpie or a specific porcelain pen but I read that liquid paint is the way to go if you want it to last long. Sharpie tends to come off in the dishwasher which I wasn’t to keen about. The only thing with paint though is that you also will need a super fine paint brush and patience to paint your design on the Mugs but honestly it’s not as difficult as it looks. If I can do it so can you! 🙂 Let’s get started, shall we? Make sure to put something underneath your working area. Porcelain paint stains are no fun. Some regular old newspaper will do. Now clean your Mugs with some alcohol or window cleaner. Keep an alcohol soaked kitchen roll nearby to clean up little mistakes you make while painting. It will happen, so be prepared! On to the next step: Draw your design on some paper. You can also print something out and copy it from there if you’re Lettering-skills are like mine, which is nonexistent. 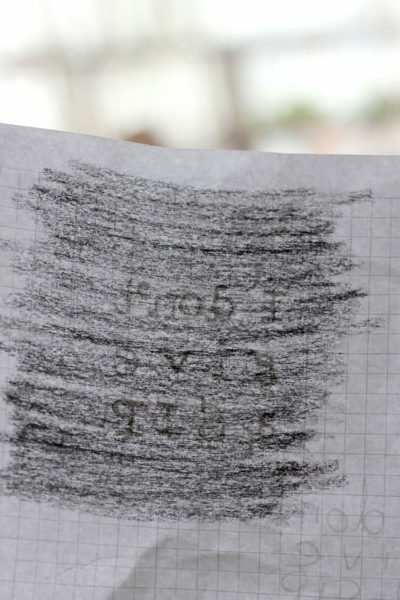 😄 Now scribble your pencil on the backside of your paper until it’s fully covered. This will help you to copy your design onto the Mug. Place the paper with the scribbled side onto the Mug and use the pencil to retrace your design. This will leave a very light copy of your design on the Mug which you can now color in with the porcelain pain. This makes it sooo much easier to copy your design. Don’t worry, you can just erase the leftover pencil marks once the paint is dry. Now all you have to do is to use very little paint and a fine brush at first to make light streaks. If you make little mistakes like me you can use the alcohol soaked kitchen roll to clean them off right away. Don’t wait as the paint will be nearly impossible to get off once it’s dried. When you’re happy with your design you’ll just have to let it air dry for 48 hours. But read the label of your paint. Some paints will need to be baked in an oven to become washable. Just follow the instructions of your paint. 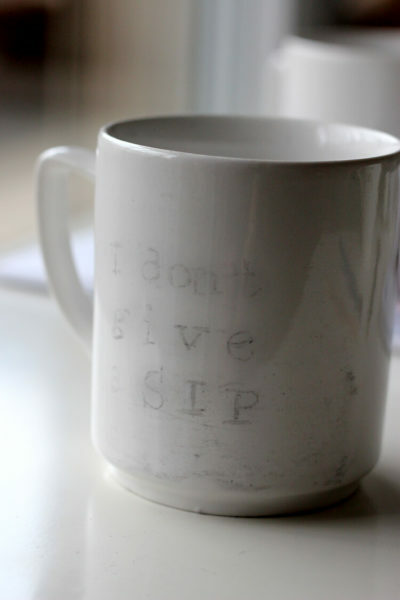 Using liquid porcelain paint for these DIY Painted Mugs should make them dishwasher safe. I’m in love with how the painted Mugs turned out and will probably hunt for more thrifted cups to paint as gifts for Birthdays, Easter, Christmas, you name it! Give it a try! I can’t wait to see your results.